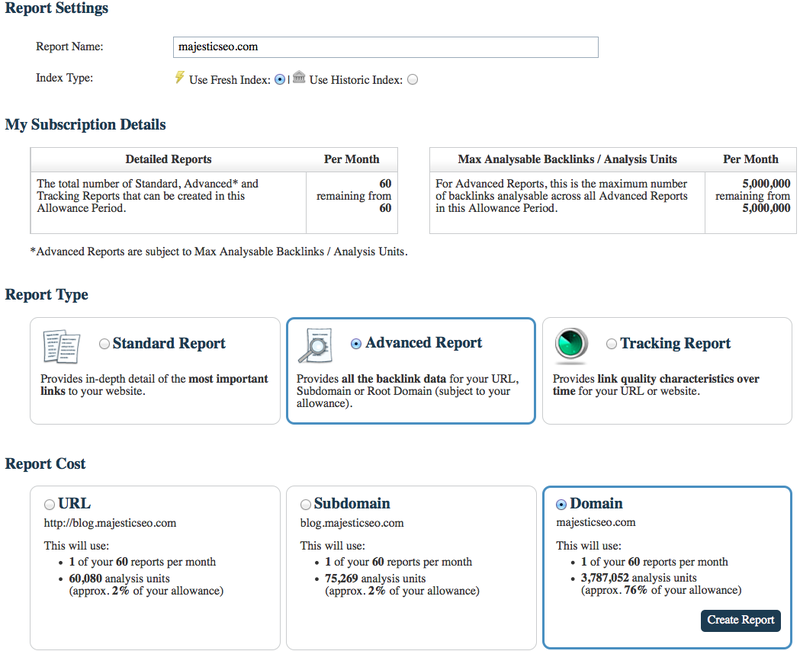 Majestic Site Explorer doesn’t show you EVERY back link we know about – but we do have a report that does. This post shows how to download every backlink we know about… and even more that we didn’t. The Download All Backlinks Report. When you initially type in a URL into Majestic, we start in Majestic Site Explorer, to show you the top data from a small subset of the whole index we have. If you are on a silver subscription, this limits the results to the top 2,500 for example. This is a load – but not all of them. If you are analyzing Penguin problems or exporting our data into third party analyzers, you should make sure you take the right data! The report you need should be “advanced”. If you get a “Standard” report, the list of links increases from 7,500 in a silver account to 20,000 in a platinum account, but only ADVANCED reports get all the links in a data set. Be wary here – this screen doesn’t recall whether you requested the URL / Subdomain or Root Domain in the home screen, so check your settings on this screen before clicking “Create Report”. This takes you through generating all the links to the site from this report. 1: Remove of reduce the default filters! By default we assume that you do not want ALL the data in the list. In the screenshot above, you can click on the word “filters” and choose whether you really want to see the links we have assumed you did not want in the report. If you have link data from other sources – like an export from Google Webmaster Tools or any other report, you can upload these to our crawler using the Bulk URL Submitter. This will not be instant, but over the next few days our crawler will take into account your data and prioritize its crawl decisions accordingly, As our index is constantly updating, you should find that we check the URLs over the next few days. If there are still active links to your site at this time, our index will be updated accordingly. Wow, that is a huge improvement and it will be really helpful for these “smaller sites” as you have called them. Well…. this does not work for me. I have tried every report combination. All I get is a one line summary report. Please set up a support ticket with a screenshot of where you are clicking the download link and the service team will help you out. i would like to see the comparision between standard and advanced report. That’s quite a good idea. Let me see if someone can write something up. Thanks for the article I didn’t know about this feature. Have created a report and hope will get a response soon. Once again thanks much! Yeah, I also had no idea about this feature. I will try it out as it sounds very promising in finding out about the links I could only guessed so far. Brilliant! I never knew – thanks for explaining how to download reports and make the most of all my back-linking efforts. It can be discouraging to create backlinks which seem to remain unrecorded by search engines and data collectors. Now I will know where all the bodies are! Still trying to figure it out…whew!